The benefits of a plant based diet are often in the media. But what does a plant based diet actually look like, and if you were thinking of adding more veg and less meat and fish to your diet what do you cook? Well I may very well have the answer! 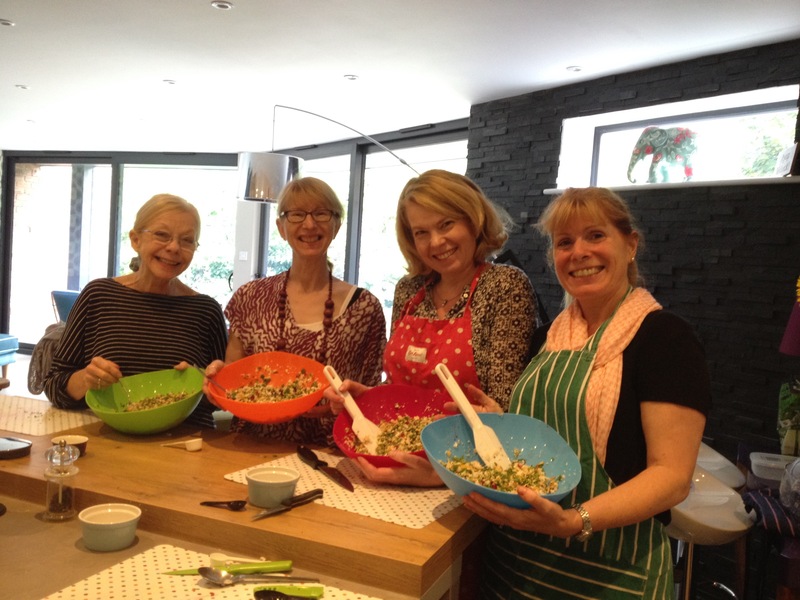 I will be running six-week vegetarian and vegan cookery courses in West Bridgford. They will be delivered on Mondays 11.30am - 12.15pm, Tuesdays 12.30pm - 1.45pm, Tuesdays 5.30pm - 6.45pm, Wednesdays 11am - 12.15pm and Fridays 11am - 12.15pm. As the groups are small (a maximum of four) the times could be flexible. View more images of the class here: http://www.nutrition-coach.co.uk/blog/simply-veg/. So what’s in it for you if you sign up? 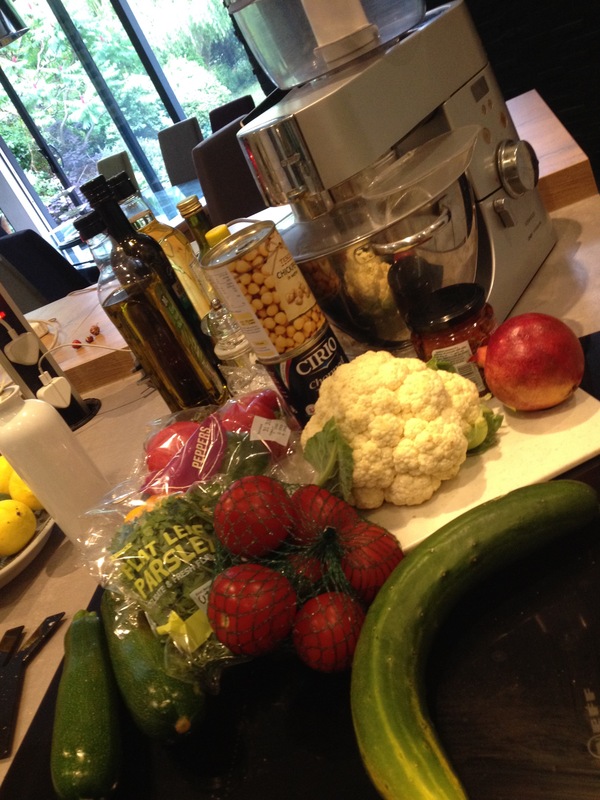 I will provide all the ingredients, equipment and recipes. You will prepare and cook your very own vegetarian or vegan meal, which you can take home for the family to eat and enjoy. This is ideal for all you veggie virgins who want to eat less meat but don’t know where to start. Its also great for would be students who are about to embark on independent living; after all we all know how cheap seasonal veg can be. Maybe you have a vegan or vegetarian member of the family and you’re struggling to know what healthy and nutritious meals to cook them, or you want to lose some weight, change your diet and feel fitter. 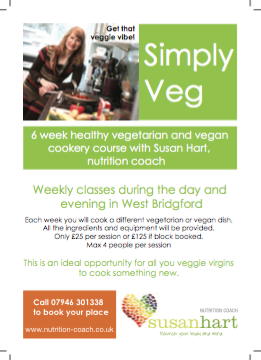 Then coming to my ‘simply veg’ class could be just what you’re looking for. 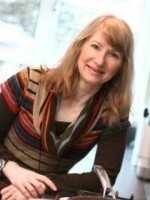 As a lifelong vegetarian and chef I will share my knowledge, tips and experience and help you to get that veggie vibe. I have advised clients for a number of years about how to make small but permanent changes to their diet, so the meals are going to be balanced and nutritious. Each class will have a maximum of four guests, and rest assured my kitchen is up to scratch having recently been awarded a five star hygiene rating. I am also the proud owner of a H.O.T (healthy options takeaway) award. All this for £25 a session, or if you block book all six the price reduces to £125. By talking informally about how to develop a healthy balanced diet I encourage and motivate clients to make small but permanent changes to the foods they eat. I have developed tools and techniques to help them make healthy food choices, which will make them feel and look great.